So I was cleaning the bathroom the other day, wondering to myself how three children can make one room smell like a subway station urinal in a matter of hours, when I spied the empty toilet paper roll on the counter. Of course, not one of my children had thought to put out more toilet paper—that would be far too much effort—nor had he or she endeavored to toss the roll into the trash can. But as I picked it up to throw away, I stopped myself—wondering, as I do a hundred times a day, if it can be recycled. Sometimes I wish I didn’t know about toxic chemicals and pesticides and global warming. It would be damned easier to keep my head in the sand. Here’s how my thought process went: It’s paper, right? But there’s glue or some kind of toilet paper adhesive stuck to it. Does that mean it can’t be recycled? What about my almost-empty shampoo bottle? Should I leave the roll in the bathroom until that’s done and then take them both down together? What if I leave it and someone throws it in the trash? Will I dig it out? Will I be able to find it? Will I go to bad environmentalist hell if I can’t?!? And then the reality hit me: I’m stressing over a f$%*&g toilet paper roll. Yes, it’s important to recycle and buy organic and clothes swap and plant a garden and avoid synthetic chemicals in my beauty products and keep my kids away from BPA. But it’s exhausting! Sometimes I wish I didn’t know about toxic chemicals and pesticides and global warming. It would be damned easier to keep my head in the sand. Life now is like living a constant double-take, where you go to do what you’ve always done and then—screeching to a halt, hand holding toilet paper roll above the trash can—realize that you need to think about its environmental implications. Also helpful is to remember the stakes: Not to get all heavy on you or anything, but in August we celebrated Earth Overshoot Day, which marks the date when the world’s population exhausts our natural resources. Each year, that day arrives earlier. And at this point, we need the resources of about one-and-a-half Earths to support the demands of the one we’re on. So it might help if we could hold each action in our lives up to the litmus test of: Can I do this another way so it has less of an impact on the Earth? The toilet paper roll encounter is a perfect example. A few years ago I would have just tossed it in the trash—but this time, I recycled it. And the shampoo bottle, too. Eight out of 10 plastic bottles aren’t recycled in this country. My shampoo bottle won’t be one of them. But I wonder what the stats are on toilet paper rolls? The lead photo is from Mrs. Polly Rogers blog, where she transforms empty toilet paper rolls into art. Seriously. And I just stress over recycling them. Sigh. 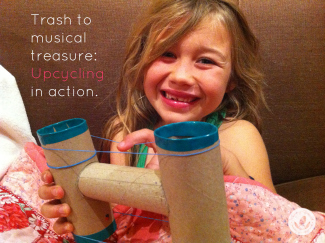 Update 10.31.13: A few days after published this recycling rant, my daughter came home from Grandpa’s with an upcycled toilet-paper-roll-rubber-band guitar. And it plays. So THAT’s what we do with them! ← Sean Penn, Environmental Paranoid? I can totally relate to the toilet paper roll conundrum. Since we got one stream in out neighborhood it has made recycling so much easier and my actual trash volume has gone down so much. I find myself doing the double take at so many thing — can that be recycled or reused? Does someone I know reuse those? Fun! Love the candy wrapper headband, my daughter would totally rock that 🙂 Good for you Alicia, thanks for sharing your upcycling awesomeness! also, all of that toilet paper is compostable. so for me, almost all (except bottles) of the bathroom ‘trash’ goes in the green bin. at my corporation, the ‘waste basket’ in the bathroom is a green compostable liner. I dig out those toilet paper rolls out of the trash. So you are not alone! Hi there, I enjoy your blog and know the feeling you write of, only too well! The reason we feel exhausted is because it requires effort to think that little bit further (in addition to everything else we have to achieve in the day). You probably will have noticed that people who habitually pollute and/or don’t care about recycling are very relaxed individuals, by comparison. Being wilfully ignorant means that they don’t have to think about doing the right thing, just their own thing. In the interests of staying on topic, though, I agree that the empty toilet rolls have their uses: they are great as cat toys, kid’s craft components and seedling planters. Hey Rachel! We’re in the same boat. During my cleaning and de-cluttering expeditions I too take several momentary pauses before throwing something in the trash. I ask myself if I can re-purpose it. 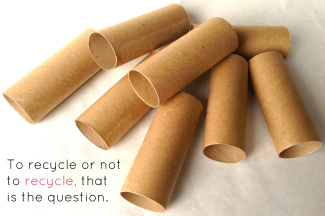 Fortunately, toilet paper rolls make an excellent tool for DIY crafts. All simple and fun. I’ve blogged about them too : ) .